Well, the mini Fair Isle is finally bound, and yes, I did finish it up by hand. A one hour wait at the doctor’s office on Tuesday and then two hours for an oil change today allowed me to finish. (It seems I get the most sewing done at the car dealer- something to think about). Very far from perfect, but I think it was a decent salvage of a quilt that went horribly wrong. 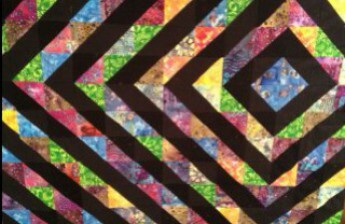 The quilt was backed with a mint green plus sign pattern, bound with scraps from the front and quilted with parallel straight lines at every 1/3 inch. Now I have moved on to quilting the (No) Golden Shadows quilt. It will be overlapping ovals in straight lines. Turquoise and then a dark reddish brown. Each row is taking about two hours and I figure there will be about 35 rows in all. Luckily, I am finding this monotony very relaxing! Here is a picture of the turquoise. The red will overlap in the middle of the two rows. And finally, I have started sewing a memory quilt for my son’s best friend. So far it looks amazing! This one will get a blog post all it’s own!